BEIJING - Even before the waves stopped washing over the northeast coast of Japan, Li Guangqiang began the search for his son. The professor knew that his son, a university student in Sendai, Japan, was living near the epicenter of the 9.0-magnitude earthquake that wreaked havoc on the coast last Friday, sparking a tsunami that swept far inland, devastating towns and villages. His concern was multiplied by the knowledge that Sendai is only 100 km north of the Fukushima nuclear power station that is at risk of explosion, leaking radiation and meltdown. After countless failed efforts to reach his son - or any other friends in Japan - through mobile phone or other telecommunications, the anxious father could not sleep and after midnight began a search online. On www.renren.com, a social networking website popular with overseas Chinese students and new graduates, Li found a forum dedicated to keeping contact with relatives and friends in Japan. Many had left messages on the forum, leaving the names, addresses and contact details of the people they were looking for in Japan as well as giving their own contact information. 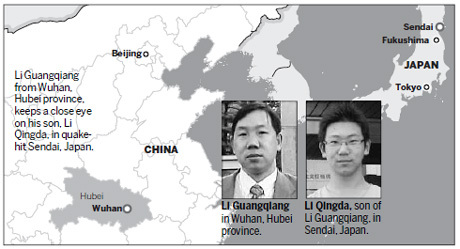 In desperation, Li left details about himself and his son Li Qingda, a 21-year-old law student at Tohoku University. By noon the next day Li heard from his niece that his son has been confirmed safe and alive in Sendai through the website Sina Weibo, China's equivalent of Twitter. "My niece and apparently someone else forwarded my message to Sina Weibo. Then someone in Japan responded to my message, saying that he finally reached my son after more than 40 failed phone calls and confirmed his safety," Li said. Even though Li has not personally heard from his son, he and his wife were able to calm down somewhat after the message. Over the next few hours, Li received dozens of calls and messages, mostly from people he didn't know, telling him that his son had been confirmed safe on the website of the Chinese embassy in Japan. On Sunday morning, a friend in Tokyo said his son called again and was safe. His son also sent a short e-mail from his mobile phone to a friend in China on Monday morning, saying: "I'm fine. Don't Worry." Li said he has kept contact with his son over the past three days through these relayed messages. "We haven't had the chance to speak to each other," Li said. "But at least we know he is safe." Now a 48-year-old professor at Wuhan University of Science and Technology, Li once spent three years studying for his PhD in Sendai - also at Tohoku University - and then worked another two years at Tokyo University after graduation. Over the years, Li experienced several earthquakes, including the 7.2-magnitude quake in Kobe that killed 6,400 people in 1995 - the previous worst earthquake in Japan's recorded history after the 8.3-magnitude Kanto earthquake in 1923. "But compared with this one, the Kobe earthquake had much less impact," Li said. "Without those warm-hearted people and the Internet, we wouldn't have been able to stay calm at a time like this." Thanks to real-time information updated by many people in Japan and occasional correspondence with friends in Tokyo, Li said he was able to keep close track of his son. "We know he is staying in his apartment. We don't know how much food and water he still has, but we don't dare call him because we know the connection is poor and electricity is scarce there," continued Li, who knows from online that there is a recharging center in front of the Sendai train station which everyone is allowed to use for a few minutes. Like many people, Li is especially concerned about possible explosions at the overheating nuclear reactors at the Fukushima power stations. "But we are grateful - so far so good," Li said.